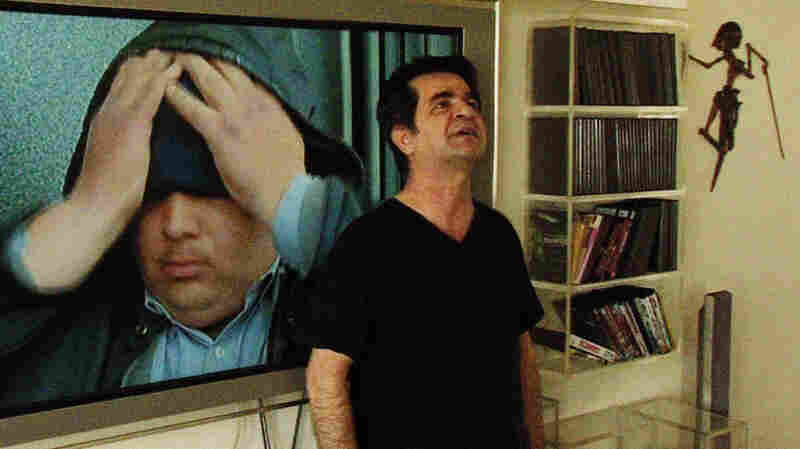 For a film that had to be smuggled into Cannes inside a cake, Jafar Panahi's banned This Is Not a Film — wryly referred to in the end credits as an "effort" — appears on the surface to be remarkably uneventful. The acclaimed director prowls around his handsome Tehran apartment, talking on the phone to his family, his lawyer and his close friend and collaborator, Mojtaba Mirtahmasb, who soon shows up with a digital camera to record what is and isn't going on. Panahi feeds his daughter's enormous pet iguana, which climbs up his chest and places a proprietary claw on his laptop when insufficient attention is paid. He makes a lot of tea, watches DVDs of his past work and uses his iPhone to watch the city gear up for New Year fireworks. Mostly, though, he talks to the camera about the new movie that the Iranian authorities refuse to allow him to make. So what are we seeing here? An extreme-verite documentary about the daily frustrations and covertly seized opportunities of a filmmaker under house arrest? A deadpan-funny episode of an Iranian The (Home) Office in which nothing resembling work gets done? A Kafkaesque discourse on the sinister absurdities of the Iranian legal system? A political and personal tragi-comedy? All of the above — and if you pay close attention, there's also an exhilarating evocation of how art is stubbornly made, and arbitrary authority put in its place, under the most confining conditions. Rene Magritte, whose famous pipe painting is slyly honored in the movie's title, would be jazzed. This Is Not a Film was made while Panahi was under house arrest, waiting to hear the results of his appeal of a 6-year prison sentence and a 20-year ban on all further filmmaking — strictures imposed in retaliation for his open support of the opposition party in Iran's 2009 elections. In trying to stifle its filmmakers, Iran could hardly be doing more to catapult them to prominence. Panahi's arrest in 2010 brought him scads of publicity, as well as the support of high-profile filmmakers in Hollywood and around the globe. Yet like most of his fellow Iranian filmmakers, to whom the movie is dedicated, Panahi has always had to ply his craft obliquely. Every screenplay must be officially vetted for subversive messaging; directors are frequently denied exit visas to present their work at international film festivals; growing numbers either choose or are forced to live abroad. Partly in response to this blatant repression, but also out of a deeply rooted tradition of quietly humanistic storytelling, a national aesthetic has emerged that parses the intensely dramatic significance of ordinary lives. A disciple of Abbas Kiarostami (Certified Copy), Panahi has distinguished himself as a champion of subjugated girls and women engaging in obstinately purposeful rebellion. His first feature, The White Balloon, seemed to be about nothing more than a tenacious little girl running around Tehran to buy a goldfish for the New Year holiday. The Circle follows several women as they chafe against restrictions that don't apply to men. In Offside, a young woman dresses as a man to try to get into a soccer match, which women may not attend. And the new not-movie — which he tries to breathe into life by reading the screenplay aloud and mapping it out on his living-room rug — is about a young woman whose religious parents have locked her in their house to prevent her from going to college. The parallels to Panahi's plight may be clear, but this frequently funny not-a-film is anything but a pity party. True, the filmmaker's palpable anguish at not being able to start work on a story that is camera-ready in his head — "If we can tell a film, why make a film?" he fumes — may break your heart. Yet Mirtahmasb's digital camera follows Panahi on a journey across externally imposed limits, showing that when artists are muzzled one way, they usually go ahead by other means. Chafing against the restrictions that prevent him from committing his screenplay to film, Panahi is "sidetracked" from his own troubles by an intense curiosity about those of others — a curiosity that fuels all his works. Watching footage and outtakes from his own films, he delivers a wonderful commentary on the collaborative process. And when his friend leaves, he follows the building's custodian into an elevator and travels with him floor to floor to pick up trash. On that short journey, we learn about the young janitor's hopes, dreams and frustrations, about the pesky neighbors, about the "they" who wield their own cameras to record Panahi's every move. In Panahi's world we all contain multitudes, even a lonely artist who will never stop taking the measure of his fellow men and women, even — perhaps especially — when he can't leave home.